I think I’ve lived a good deal of my life with my senses on high alert. When the boys were babies and I was a single mom, I remember sleeping with one ear measuring the rhythm of their breaths, the other attuned to the sounds of the house – I had to be ready, just in case. I have always been neurotic at work – my silly view that as technology allowed 24/7 availability, I was supposed to be available in every time zone (for we had 33 office around the world). This made me a very valuable employee in the environment known as ‘Big Law’ – where the bizarre ‘play hurt’ philosophy still drives the billable hour and the head-shaking awe and respect of others. I’m the person you want in a crisis – no tears, very collected, logical – I’m ready. Divorce? Death? Employment issue? Performance problem? Marital angst? Sick child? I’m your woman. I can make it through Whole Foods in fifteen minutes and fill the cart with the proper items. I don’t love anyone or anything in a half-assed way, and as such I will give it everything I’ve got – no questions asked. I have run head long into life – but for the times when I’ve crashed into a wall. I crashed into a wall when I was diagnosed with this stupid autoimmune disease that makes my joints swell inexplicably, the tendons twisting and rioting without provocation. When I realized that after too many surgeries I was going to have to figure out the music that accompanies chronic pain so I could understand the rhythm I’d be dancing too (I hate being off the beat, though I am clearly off-beat). I didn’t see the wall on Sunday. We were having brunch with our friends who asked about the Jewish ritual of sitting shiva – a seven-day mourning period after the death of an immediate family member. After seven days in the house, one is supposed to go outside and walk back into life. I remembered my sister and I doing this after the shiva period for both of our parents. I couldn’t speak, for the pain of missing my parents was so visceral in that moment. And I swear to you, for a moment I thought my heart stopped. Walking back into life. Walking back into life a person changed forever. So it was when I retired last year. No need to re-visit the early days of dissonance, when no notes came together to form a lovely sound. Suffice it to say, I was opening the door and walking outside, completely unfamiliar with my space in the world. At first, I walked with purpose – almost defiantly. At some point I slowed, realizing that I had the chance just to breathe. I wasn’t driven by urgent need – or my perception of urgent need. I didn’t need to walk back into life for any reason other than it was my due. It has taken me months to figure out this new rhythm, embrace the richness of this music and accept that just being me is reason enough to walk into life. I need not be raising and protecting my delicious boys, I don’t have to be grieving, I don’t have to be on call for anyone who may need me for reasons which they consider critical (but in retrospect were often pretty self-serving). The beauty of stopping before you open the door lies in the anticipation of what you will find. Each day, I now pause. I close my eyes and open them just to be surprised at what may appear before me. Goofy? Perhaps. A reminder that this is the only moment? Definitely. Posted on June 19, 2012 by mimijk •	This entry was posted in inspiration, life lessons, love, mindfulness and tagged Chronic pain, health, Judaism. Bookmark the permalink. I learned a lot about you here…and I’m more inspired today, than yesterday. As to “no notes coming together to form a lovely sound” – you’re playing Beethoven for me pal…Beethoven. I sure as hell hope you like Beethoven my friend…:-) Thank you, thank you..
What an exquisite elegy to one phase of your life, Mimi. You paint such a vivid picture with your words–I am there with you at each moment you describe. This Khalil Gibran quote sprang to mind… “Your living is determined not so much by what life brings to you as by the attitude you bring to life; not so much by what happens to you as by the way your mind looks at what happens.”. I admire your attitude so much…. Pshaw! But of course you’re deserving. 🙂 And isn’t that funny that we share a love for Gibran–not surprising, I have to confess, but delightful. I feel like you and I have known each other for a loooong time – in all the good ways that suggests. Thank you for being the wonderful, inspiring, generous, amazing person you are..
To me, there is something wonderful and enchanting about just taking a walk. It is a time, each day, when I let the thoughts fly free… and often I find solutions to problems that have been aggravating me. I can imagine, that it’s quite a bit harder when your joints ache… but I believe that if it’s at all possible, it’s worth it. Retirement is not at all the way we imagine it before we retire, but it can really be a fine period of our lives. I am embracing retirement now with an affection I didn’t anticipate. I have the joy of consulting still – which suits my schedule (or lack thereof)..And yes, I walk daily – with my dogs and love the time to just be. I am not one to sit too still – I go to the gym, dance in the kitchen and admit to a certain unique rhythm while folding laundry. I view my physical issues as one would a lousy neighbor with whom you share a property line. You have to learn how to deal with it, but you don’t have to like it (or spend too much time dwelling on it)…:-) Have a good day Shimon and thank you for writing.. I love the way you describe the need to figure out the music so you can find the rhythm…I just love the way you write period! I’ve told you this before, but it’s worth repeating, your writing is like getting a hug…everyday. I hate that you have chronic pain but I love that you have the music, are finding the rhythm, and are willing to dance. Walking back into life…yup…sounds damn good! Ah, but Bob Marley – he’s all over my iPod!!! How can you feel bad when listening to reggae? I love you and send you mega hugs – if my writing can feel like that. I am truly astounded – and so happy – it means my writing voice is honest and as such rings true. That’s pretty damn awesome…thank you! Mimi, I can’t even tell you how poignant that was for me. I have finally given notice and am getting ready to step into that next part of my life. I’ve consistently felt like if I don’t make a move I’m going to get sick. Too much stress. But the first steps are always the hardest, right? Thank you so much for writing. I can feel the butterflies in your tummy, though from here I can jump up and down (albeit carefully, I’m a klutz) and yell “Good for you!!!”. Your next chapter is going to be richer and scarier, more wonderful and more provocative, more illustrative and instructive than any chapter so far…and by this point, we all have a few chapters already under our belts. Those first steps are definitely hard, and they are the steps you must take because you deserve to be healthy and happy and life never stands still. Go for it!! And if you ever feel shaky, you know where to find me! Walking with purpose…something we could all benefit from. Thank you for sharing! Beautiful post. I am so delighted that you’re enjoying your walk through life these days, and even happier that I get to walk by your side as you do so. I had something “profound” to add about the music of your words and how it takes awhile to find the rhythm once one retires, but I digress. After reading the above two comments, I think I’ll just sit back and smile with joy at the love that jumps off the page when one reads the two comments above mine. Thank you Tina! I guess this sounds ridiculous, but when I write these posts early in the morning, with a cup of coffee and the whole world silent, I have fewer filters (and re-writes) of my posts. It truly is only this moment that we know of – the rest is all faith and hope. Enjoy your day!! I love the early a.m. Also, it is a wonderful time to think and ponder…. You make me happy and not many people do that, so thanks. And you just made my day, so thank you back. Yay!! Another Marley fan – why does it not surprise me that you would like him too? 🙂 I am touched that you would find me inspiring, given how much I love your blog and derive so much from my visits..
You write with such beauty and honesty, Mimi. Thank you for this story. It moved me. I delight in your candor and riotous adventures every time you post, Christine. That I could pay that back in any way is a heartfelt pleasure for me. I couldn’t love this more. Good for you. I hope you enjoy the walks! This resonates with me on a whole lot of levels. The perception of urgent, the often self serving needs of some professionals, the increasingly ridiculous deadlines, all of it! Enjoy the new music and the rythm and write your own song for your future. Now that I know a little more about you, you inspire me Mimi…I always love reading your post as they pass an important message which we sometime overlook. This post was bang on. I need to pace myself to be able to enjoy life. 🙂 You are awesome, Mimi!! Oh right back at ya!! You are amazing and I look forward to every one of your posts. I picture you with your arms always wide open – to life, experience, joy – you are exuberance itself! Pingback: 4:09 a.m. and Inspired… – Lead.Learn.Live. Pingback: 4:24 a.m. and Inspired… – Lead.Learn.Live. I think I have read this at least twice, had part of a comment written and then the boys needed my attention and I could not get back to it. Your experiences, your drive and strength really inspire me. 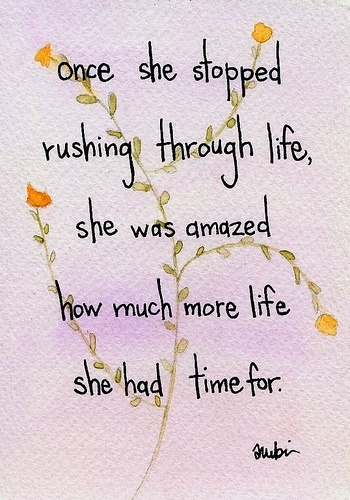 The slowing down and changing perspective – I need that with the up coming bumps in my road of life. I was just talking with a friend the other day about how there is work, then there is more work at home and it sometimes seems that there is no time or energy to enjoy the living part of life. The need to simplify life so as to live it more is becoming more apparent. I feel like I am stumbling along in this comment, one ear out for Carter to wake up and need me, but I want you to know that I very much enjoyed this post and it gave me a lot to think about. Thank you so much! I’m so glad you ‘found’ me..